It’s unsettling enough that Camolen’s wizards can’t find the rogue magic user–but the trouble has just started. A dangerous wizard escapes, Arlen’s hold comes under attack, and an entire company of peacekeepers disappears. 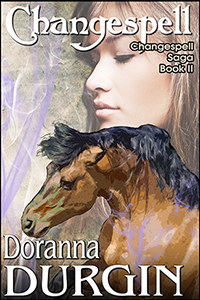 Jess soon realizes that she and her friends are at the center of events that threaten to leave her trapped helplessly in equine form while her friends fall victim to revenge and the Council of Wizards slowly loses control of Camolen.